Let your slow cooker do the hard work of cooking dinner tonight, while you focus on other things. These healthy chicken burrito bowls are simple, easy and a recipe you can count on to make the whole family happy. Whether you are on a Whole30, doing paleo, keto, or on the lookout for a healthy non-sandwich lunch idea, this Chicken Burrito Bowl applies to you. 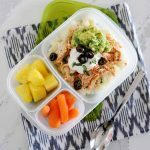 It has all the Mexican flavors we love and makes one incredible meal prep for weekday lunches. These Burrito Bowls have been a winner for many families doing the Family Kickstart, a 30-day clean eating plan that will help eliminate processed foods and sugars from your family’s diet. Think KickStart like the Whole30, but with recipes and tips that make it doable for the entire family. Trust me, you’ll still love each meal all while feeling better and more energetic. 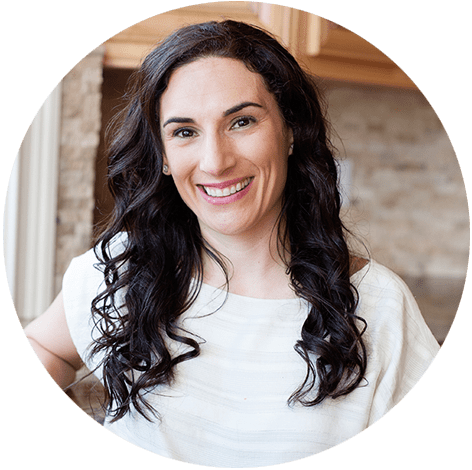 If you want to see a free sample of what my Whole30 meal plan and ingredients look like for my family, get it here. Are you back from grabbing your free meal plan? Awesome! Look how easy it is to make these yummy salsa chicken burrito bowls. 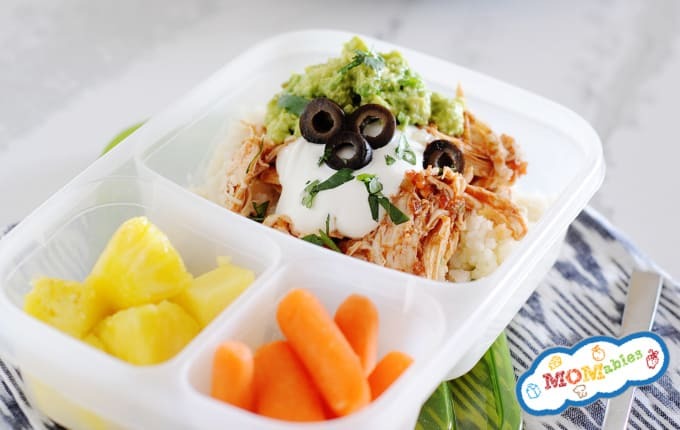 Tender chicken topped with guacamole and sour cream over a bed of cauliflower rice or regular rice, count this meal prep as your own Chipotle bowl but much healthier! Add pico de gallo, cheese, beans, and all your other burrito bowl must-haves to really make it your own. I made a few adjustments to save time like cooking the chicken in a slow cooker with salsa. While this cuts down on kitchen duty it doesn’t cut any of the flavors and can easily be doubled and used on top salads, in quesadillas, or for tacos! Another reason I love making burrito bowls is all the ingredients can be prepped ahead of time making the assembly quick for lunch or dinner. If you plan on doing tacos one night for dinner, I suggest saving the leftover cheese, beans, taco meat, and other toppings to make these burrito bowls later in the week. It’s the ultimate cook once, eat twice scenario. In case you are doing the Family Kickstart or looking to cut carbs, swap the regular rice with cauliflower rice. No matter how I serve this to my family they gladly devour it, no questions asked. Can You Freeze Chicken Burrito Bowls? They’re 100% freezable! Although, if you want to serve this with the cauliflower rice I mentioned, it will hold more liquid when thawed and reheated. 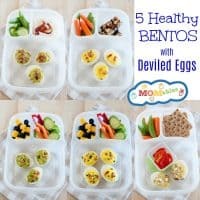 I recommend freezing all the topping such as meat, beans, salsa, and cheese in single serve containers and when ready to pack for lunch, prepare a fresh batch of cauliflower rice, add it to the container, top with guacamole and sour cream and you’re ready to eat! Otherwise, regular rice holds up great in the freezer. Who’s ready to dig in? !